Crunch and melt in the mouth buttery flavor, this Christmas cookie brings joy! One of my favorite cookies to bake. The taste and feel of this dough is so delightful you have to be careful not to eat the lot before you get any baking done. You will have the biggest fun creating your own version of these cookies with your favorite jam flavor. You can make the jam filled version and sprinkle them with vanilla sugar and almonds, but even the plain cut out versions in different festive shapes are going to be a treat. They keep their shape rather well too after baking. So put on your favorite Christmas music and start baking! Make the cookie dough by adding the salt to the flour. Next rub the butter into the flour and aim for a coarse breadcrumb consistency. Add the soft white sugar, 20 g egg and teaspoon of lemon juice and combine to make a smooth dough. Wrap in clingfilm, shape into a flat disc for easy rolling later on and refrigerate for at least one hour. This dough should be cold when you roll it out. When it gets too warm it goes a bit soft, colder dough is easier to handle and cut into shapes! Preheat your oven to 170°C / 340°F conventional setting. Take the dough from the fridge and roll to a thickness of about 2-3mm. Cut out stars and stars with a center. Place the stars on a baking sheet and add a teaspoon of strawberry jam to the center. Place the star shapes without a center on top of them. Brush with leftover beaten egg to which you add a splash of water for easy brushing. Sprinkle the stars with some vanilla sugar and finely grated almonds (you can also bake them without sugar or almonds, the cookie will still be great). 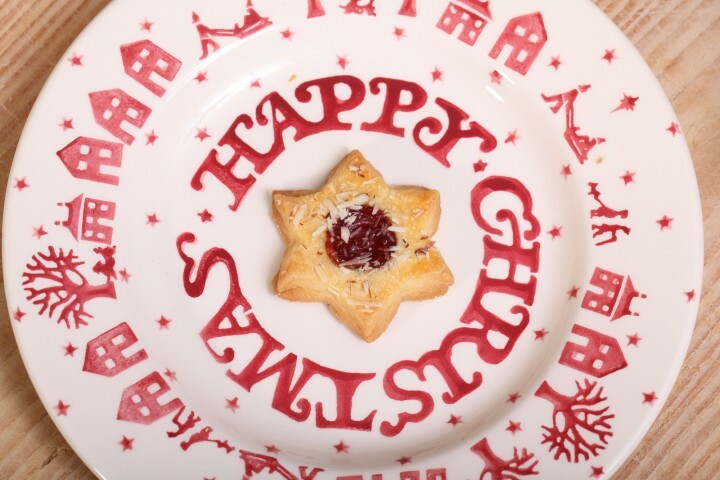 Bake the Christmas star cookies for 12 to 15 minutes, depending on your oven. Keep a close eye on them as they bake, so they will have the right light golden color. Take from the oven and transfer the cookies to a cooling rack. It is no problem at all to make these cookies in advance because they keep very well in your freezer. When stored in a cookie jar eat within a few days to take full advantage of the great butter taste. Another merry addition after baking and cooling would be the sprinkling of some icing sugar and maybe a decoration of orange frosting for example. Hi, thank you very much for this recipe and the wonderful website! Thanks to a job I am kind of stuck in rural Chile at the moment and I miss European bakeries! There are quite wonderful cakes here, too – but it’s not the same. And although there are so many baking sites on the web, looking at yours is a bit like wandering through a huge European bakery shop, which can be very comforting at times (and the recipes do work!) . So, again, thank you again and merry Christmas from Chile! PS: before I forget, what is soft sugar? Can I use icing sugar? Thanks for your kind comment. Merry Christmas from The Netherlands to you. Soft sugar is a kind of ‘white muscovado sugar’ called ‘witte basterd suiker’ in Dutch. When you can not get a white version in your country, you can substitute it with a light brown muscovado sugar. Icing sugar will not work, as this will give a different softer texture to the cookie. Very nice 😉 Have a wunderfull XMAS baking people!!! You too Alfred! Enjoy it with family and friends.